The GeekSpeak Show Timer: Bridging the gap between Geeks and the rest of humanity and the tyranny of the NPR format timings. One of the hardest parts of talking on air to thousands of people about technology is sounding like you know what you are talking about, as others wave hands inaccurately signaling that it’s time to wrap up a story and go to a break. After too much confusion and broadcast befuddlement, I used a weekend to solve the problem. The public radio format includes 3 segments for an hour long show. The breaks should happen so that the segments work out to be about 14 minutes, 18 minutes and 19 minutes long. But, the two breaks don’t have to be taken exactly on time. All that is important is for the content to be 51 minutes long, leaving time for station breaks and top of the hour news. 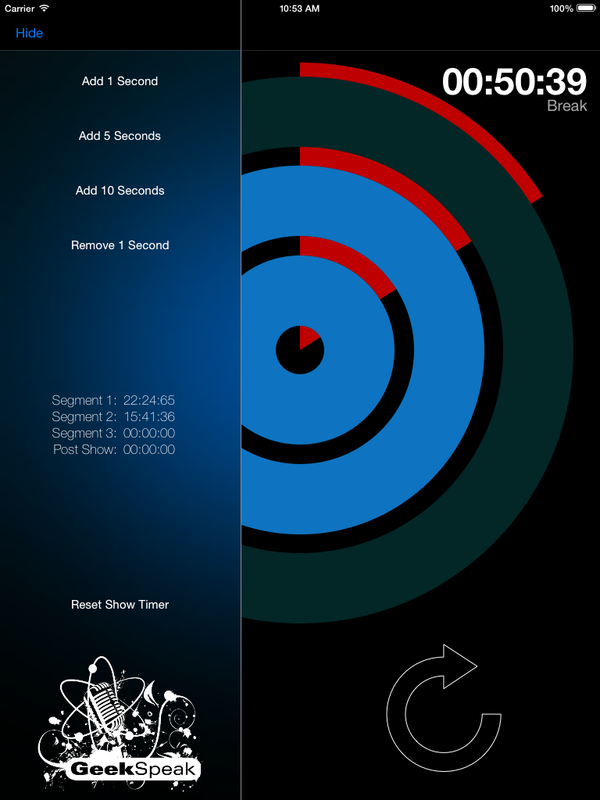 This timer fills in a ring for each segment, clearly showing how close to each break we are. But, it politely keeps counting if a segment goes long. At anytime the Next Segment button will advance the timer, starting one of the 1 minute breaks. Most importantly, the next segment is automatically adjusted to make sure by the end of the 3rd segment, the total show time will add up to 51 minutes. The is the only timing that is truely important. View the code and follow the progress of our Show Timer on GitHub.